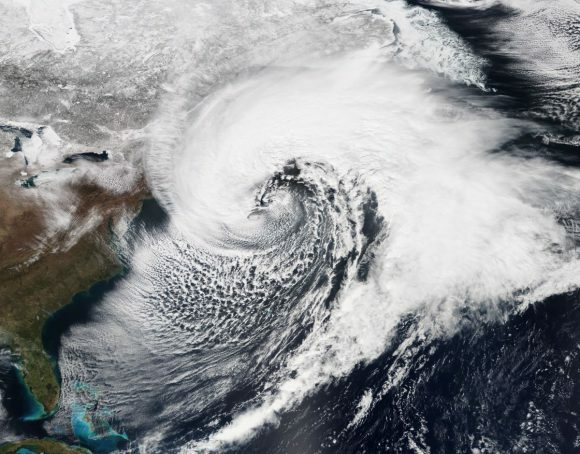 Share the post "Rutgers Scientists Study Nontropical Storms to Improve Prediction and Prepare for the Future"
An enormous nor’easter on March 26, 2014. Photo: National Oceanic and Atmospheric Administration. 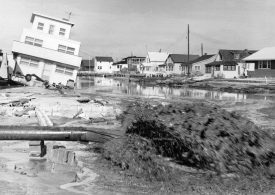 In November 1950, a freak storm spawned a record storm surge in Atlantic City and a near-record surge at Sandy Hook. Damaging winds gusted to a record 108 mph in Newark and 94 mph in New York City, while southern states endured record low temperatures and crop damage. The storm dumped heavy rain in New Jersey and up to 57 inches of snow in the central Appalachians, killing nearly 400 people across the region, according to federal reports. Luckily, the largely forgotten storm arrived around low tide in most of the New York-New Jersey coastal area, averting catastrophic flooding akin to what happened during Superstorm Sandy on Oct. 29, 2012. Although it has largely slipped from memory, researchers at Rutgers believe there is a lot to learn from the 1950 storm and others like it. Harvey Cedars, New Jersey, after the devastating nor’easter in March 1962. Photo: Courtesy of the Asbury Park Press. Catalano and Anthony J. Broccoli, professor and chair of Rutgers’ Department of Environmental Sciences, are studying weather systems known as extratropical cyclones or nontropical storms, and the storm surges they have generated along the northern East Coast. The researchers are looking at several hundred events since the early 1900s by examining tide gauge records from The Battery—the shoreline at the tip of Manhattan—Boston, Massachusetts, and Norfolk, Virginia. They’re trying to understand the atmospheric circulation patterns during such storms, which include nor’easters. And they’re trying to determine whether state-of-the-art climate models simulate them well enough to get an idea of what kind of unusual events may develop in the future so we can better prepare for them, Broccoli said. The scientists also want to look into whether nor’easters and other storms that form outside of tropical areas will change in a warming climate, and that’s a complex issue. After it ended, the freak Thanksgiving weekend winter storm in 1950 was called “one of the most destructive storms ever recorded in (the) northeast United States,” according to an article in the federal Monthly Weather Review. The storm—now known as the Great Appalachian Storm of 1950—arose from a small area of low pressure over North Carolina and western Virginia. It evolved into strong low pressure over Ohio and, combined with strong high pressure over Canada’s Labrador region, helped generate high winds in the northeastern U.S., the article says. “The strong onshore winds caused excessively high tides and flooding in some cities in Connecticut and New Jersey,” the article says. Some areas reported more damage than during the unnamed 1938 and 1944 hurricanes. According to Broccoli, the storm surge generated by the 1950 storm is the second-highest on record at Sandy Hook and The Battery, and ranks first at Atlantic City. The surge does not include the astronomical tide, which ranges from high to low daily. High tide can be at least several feet higher than low tide, and Sandy arrived around high tide during a full moon, when tides are higher than normal. In Atlantic City, the storm surge hit 5.7 feet during the 1950 storm – a foot higher than Sandy’s surge, according to Broccoli. At Sandy Hook, the surge reached 7.9 feet, only a foot shy of Sandy’s. At The Battery, the surge hit 7.5 feet versus 9.4 feet during Sandy.